Crumble the tempeh into ¼-inch pieces. In a large bowl, stir together the tempeh “bacon” marinade and 1 tablespoon [2 TBL] oil. In a large frying pan, combine the tempeh and 1 cup [2 cups] water and bring to a boil. Cook over high heat, stirring occasionally, until softened, 6 to 8 minutes. Drain the tempeh, transfer to the bowl with the marinade, and toss to coat. Wipe out the pan. While the tempeh softens and marinates, prepare the onion. Peel and thinly slice the onion. Measure ¼ cup [½ cup] for pickling and set aside the rest for roasting. In a small bowl, combine the ¼ cup [½ cup] onion and apple cider vinegar. Season with salt and pepper and toss to coat. Let stand, stirring occasionally, while you prepare the rest of the meal. Cut the Brussels sprouts lengthwise into quarters. Strip the sage leaves from the stems and finely chop enough to measure 1 teaspoon [2 tsp]. Finely chop any remaining sage for garnish (or see the Chef’s Tip for a crispier finish). On a sheet pan [2 sheet pans], drizzle the butternut squash, Brussels sprouts, 1 teaspoon [2 tsp] sage, and remaining onion with 1 to 2 tablespoons oil; season generously with salt and pepper and toss to coat. Spread in an even layer and roast, stirring halfway through, until the vegetables are tender, 15 to 18 minutes. Remove from the oven and season to taste with salt and pepper. While the vegetables roast, finish the tempeh “bacon” bits. In the same pan used to soften the tempeh, warm 1 to 2 tablespoons oil over medium-high heat until hot but not smoking. Using a slotted spoon, transfer the tempeh to the pan and cook, stirring occasionally, until the edges are beginning to brown and crisp, 5 to 7 minutes. Remove from the heat and season to taste with salt and pepper. Transfer the roasted vegetables to individual bowls, top with the tempeh and cranberries, and drizzle with the cinnamon balsamic vinaigrette. Garnish with the pickled onion and as much of the remaining sage as you like and serve. Stir the tempeh “bacon” marinade and oil. Season the vegetables for roasting. Drizzle the vinaigrette and garnish the bowls. 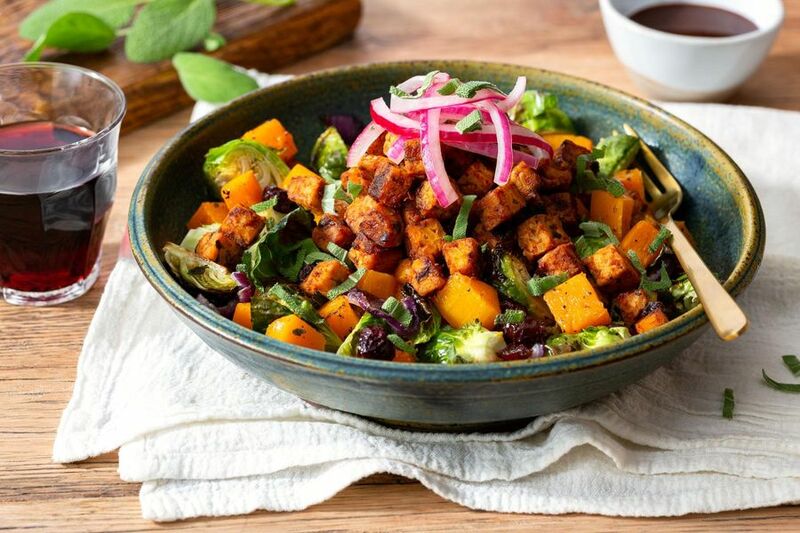 With roasted vegetables, smoky-sweet tempeh, and a cinnamon-scented dressing, this vegan bowl is definitely one you’ll want to curl up with on a chilly night. Instead of garnishing the bowls with chopped fresh sage, fry the leaves for a crisp, restaurant-worthy garnish. In Step 3, keep the sage leaves for garnish whole. In a small frying pan over medium-low heat, warm 2 to 3 tablespoons oil until hot but not smoking. Add the leaves and cook, turning once, until bright green and crisp, about 30 seconds per side. Transfer to a paper-towel-lined plate and season lightly with salt. Add them to the bowls just before serving. A cousin of tofu, tempeh originated in Indonesia and is made from lightly fermented whole soybeans, which means it has more fiber and protein than its relative, plus a subtly sweet, earthy flavor when cooked. We first tenderize it by crumbling it and cooking it in water. Calories: 810, Protein: 28g (56% DV), Fiber: 23g (92% DV), Total Fat: 41g (63% DV), Monounsaturated Fat: 25g, Polyunsaturated Fat: 3g, Saturated Fat: 5g (25% DV), Cholesterol: 0mg (0% DV), Sodium: 300mg (13% DV), Carbohydrates: 85g (28% DV), Total Sugars: 30g, Added Sugars: 11g (22% DV).